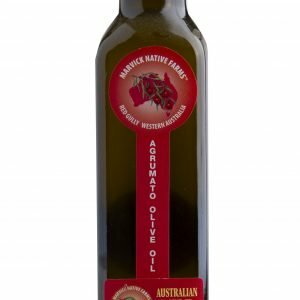 Wild Desert Lime and Olive Oil 100% Australian product. The Australian Desert Lime is small with an intense, piquant flavour. An extremely versatile fruit they can be used in any product or process where ‘normal’ limes or lemons are used, the main difference being their small size, lack of peel and more intense flavour. Desert limes require no peeling or preparation. They have the valuable attribute of freezing down without losing flavour or presentation characteristics when thawed later for use.The fruit has been analysed as a very healthy food source, having three times the amount of Vitamin C compared to oranges. 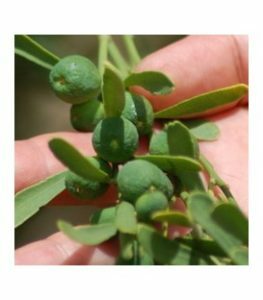 They were eaten by aborigines and have been used by generations of Australian outback people to make cordials, sauces, garnishes marmalades, pickles and chutneys. Thirsty stockmen eat the fruit straight from the trees while mustering as a thirst quencher. 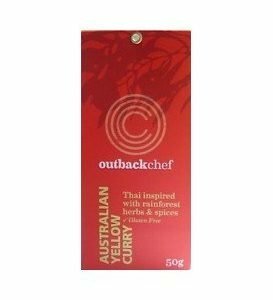 It is an Australian native gourmet treat and the perfect way to introduce your family and friends to bushfood. Use as a dry rub on red meat. Try it on a leg of lamb before roasting, rub generously and leave to marinate for a couple of hours before roasting. Otherwise, mix with a little oil, chopped onion and garlic and use as marinade. Inside pack there is a great recipe for a Bush Tomato dukkha that is not only easy to make, but tastes wonderful.